A custom built yacht designed by Dubois Naval Architects the yacht features a fresh and elegant interior by British design house H2 Design. Combining luxurious style with large and social onboard spaces, Rare Find has a long record as a popular charter yacht and is the perfect base for an unforgettable Greek or Mediterranean holiday. 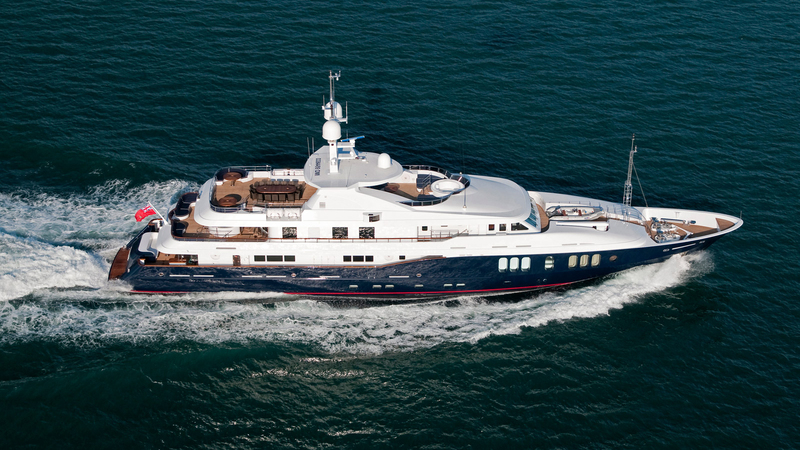 Able to welcome 12 guests on board, her crew of 12 promises an exceptional charter experience. Accommodation includes the large full beam master, VIP suite, two doubles and two twins. The perfect entertainers yacht, Rare Find boasts ample spaces across every deck. Active guests can enjoy a work out with a view in her fully-equipped gym, while water lovers can take their pick from a packed water toy inventory. The perfect entertainers yacht, Rare Find boasts ample spaces across every deck. The main saloon is an impressive space that is beautifully styled, with Sycamore wood throughout. Features include a full formal dining table for 12, lounge seating, an entertainment system, a bar and seating. Leading out from the main saloon, the main aft deck features outdoor lounge seating and a table, with stepped access down to the swimming platform. A second main indoor guest space is the skylounge, with relaxed seating, a bar and games table, that connects out to the upper aft deck dining space, perfect for al fresco meals. The sweeping sundeck offers still more space, with an inviting Jacuzzi, bar, seating area, sun loungers and an additional al fresco dining space. Accommodation includes the large full beam master, VIP suite, two doubles and two twins. The master suite’s many features include a vast walk in wardrobe, his and hers bathrooms, a private office, and floor to ceiling windows that provide breathtaking views. Both the master and VIP are located in prime position on the main deck, and their close proximity is well suited to family groups wanting to be close together. The yacht has been designed to be a versatile space, for all group types and uses. Well suited to a wellness charter, the VIP cabin is able to convert to a massage therapy room for the ultimate in relaxation. Active guests can enjoy a work out with a view in her fully-equipped gym, located adjacent to the sky lounge, or zen-out with a sunrise yoga session on the sundeck. Meanwhile water lovers can take their pick from a packed water toy inventory, including several tenders, Laser sailing dinghies, kayaks, towables, jetskis and more, with the yacht also verified as a RYA water sports training centre. Cruising at 14 knots, comfortable cruising is assured thanks to zero speed stabilisers.